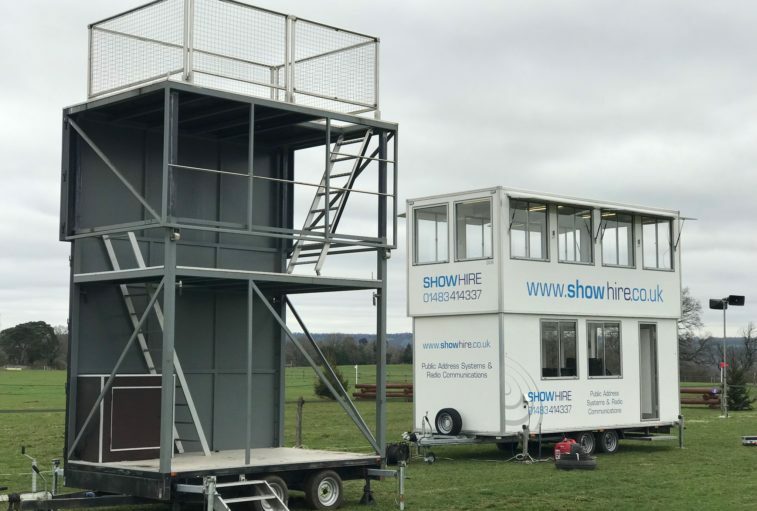 With 360° vision, and a choice of large working areas to suit individual requirements, Show Hire’s units are unmatched within the events industry. The majority of our units are 16 feet long, and the largest boasts an upstairs area of 289 square feet (27 square metres). For specific information about each unit, please click on one of the items below. 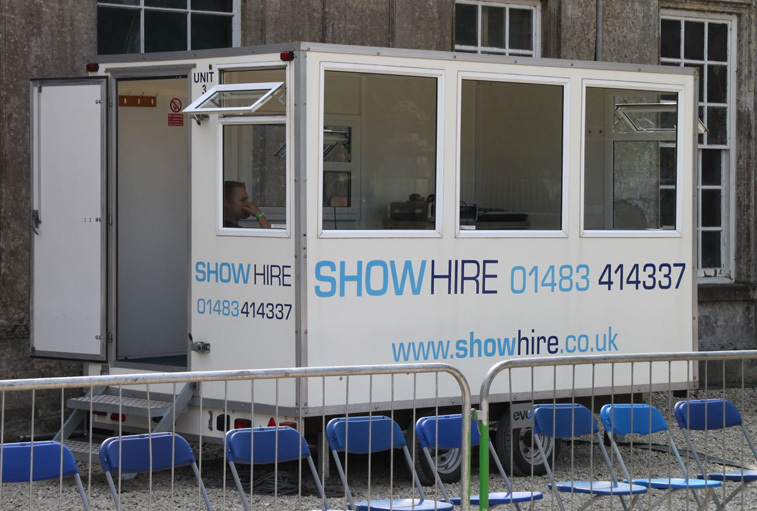 We are a rapidly expanding business, and our equipment hire division continues to grow. 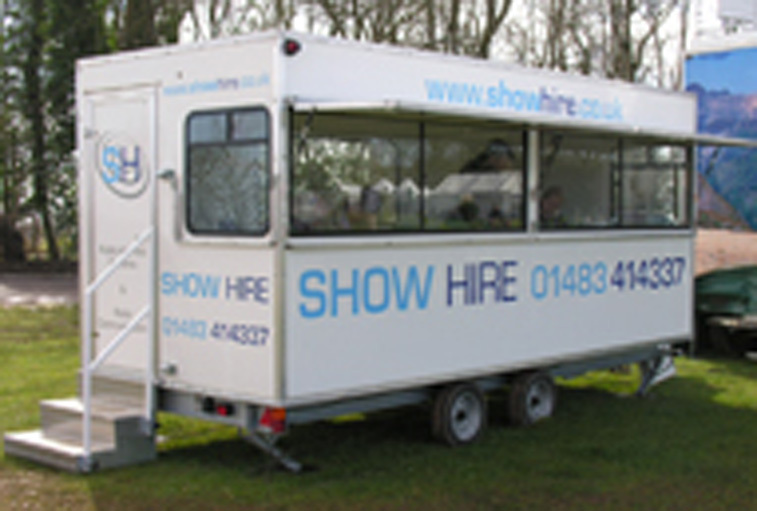 If you cannot see the equipment you would like to hire on these pages, please contact us. 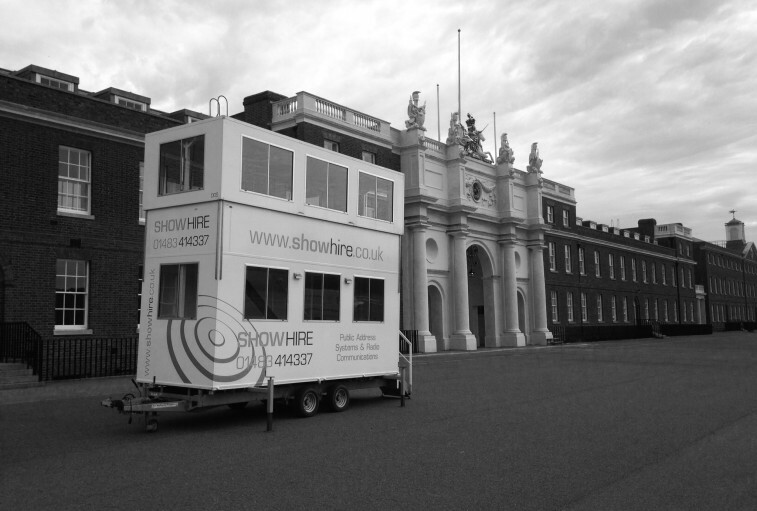 With 360° vision, and a choice of large working areas to suit individual event requirements, Show Hire’s units are unique to the communications industry. All units are 16 foot long, with the largest of our units having an upstairs area of 289 square feet. 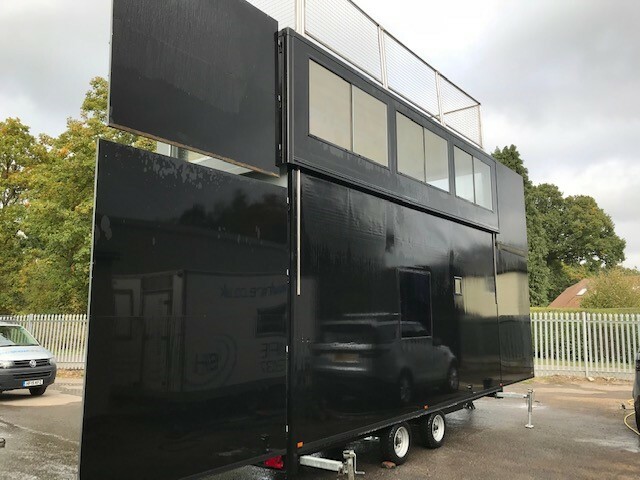 Unit DD9 is identical twin of our DD6 twin-axle, two-tier commentary box trailer with 360-degree visibility upstairs through all-round windows. 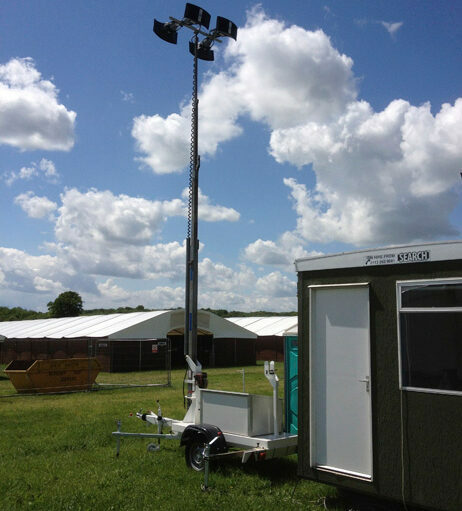 It is fitted with 240v sockets, microphone inputs, telephone points, and strip lighting. 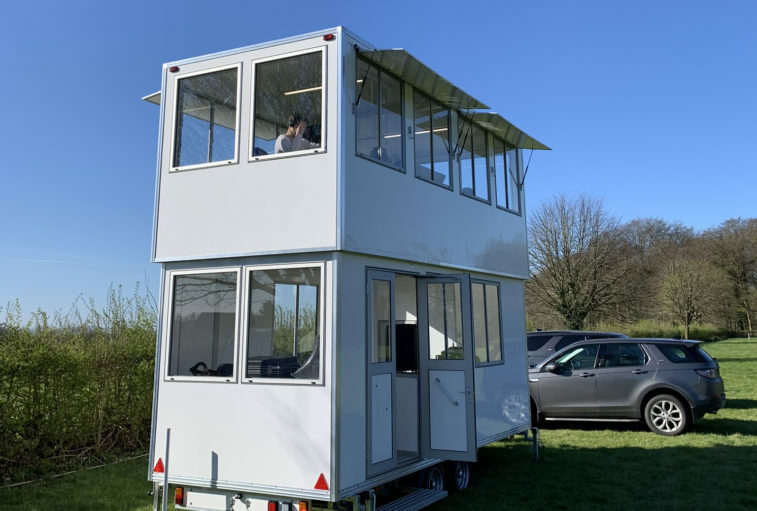 New for 2019, the DD7 commentary unit is an unbranded twin-axle, three-tier commentary box trailer. 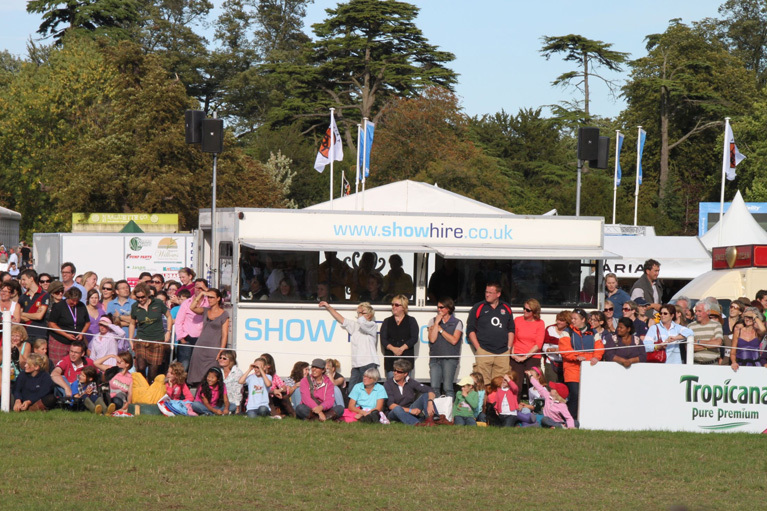 A hatch in the upper deck ceiling gives access to a fenced level roof, ideal for filming and to give a bird’s eye view over your event. 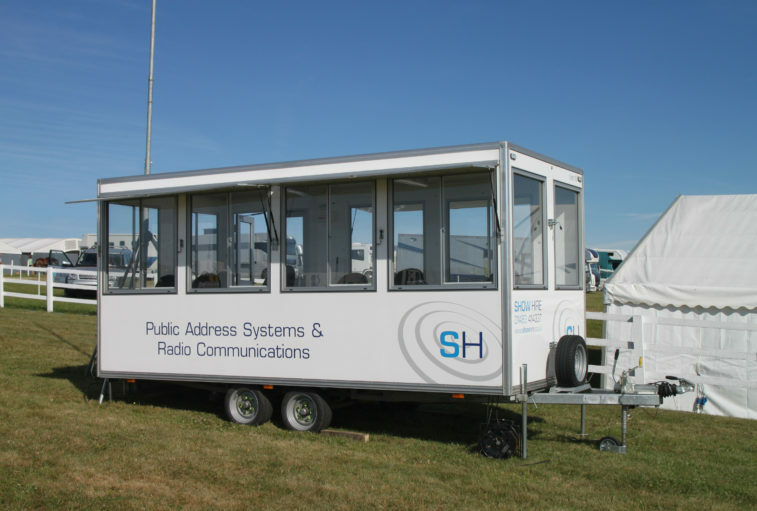 Unit DD6 is a twin-axle, two-tier commentary box trailer with 360-degree visibility upstairs through all-round windows. It is fitted with 240v sockets, microphone inputs, telephone points, and strip lighting. 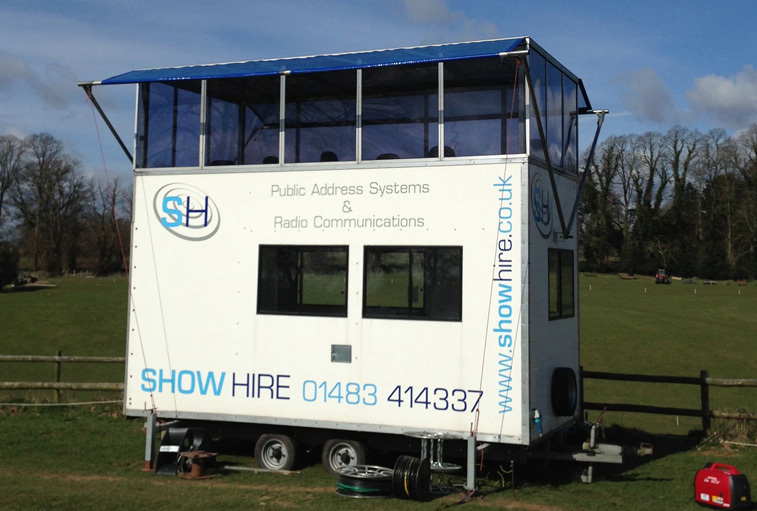 Unit DD5 is a twin-axle, two-tier commentary box trailer with 360-degree visibility upstairs through all-round windows. It is fitted with 240v sockets, microphone inputs, telephone points, and strip lighting. 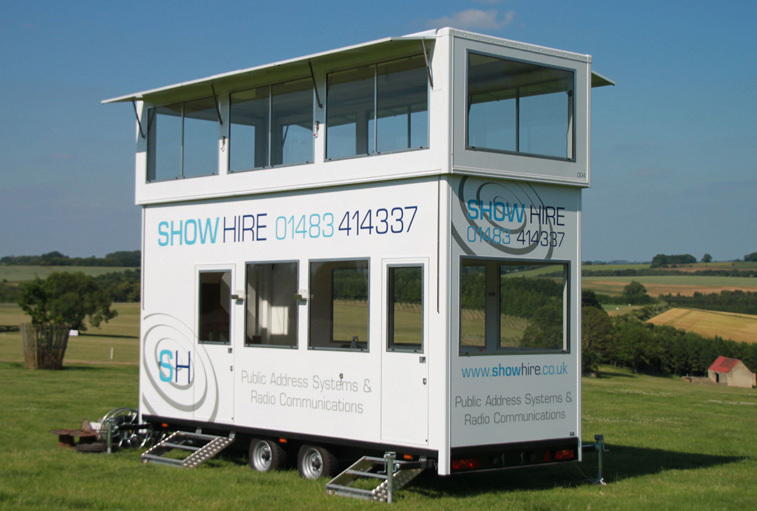 Unit DD4 is a twin-axle, two-tier commentary box trailer with 360-degree visibility upstairs through all-round windows. It is fitted with 240v sockets, microphone inputs, telephone points, and strip lighting. Unit DD2 is a twin-axle, two-tier box trailer with 360-degree visibility upstairs through all-round, tinted windows. The upstairs area uses a gull-wing mechanism, which, when erected, gives a floor area of 5.18m x 3.55m. 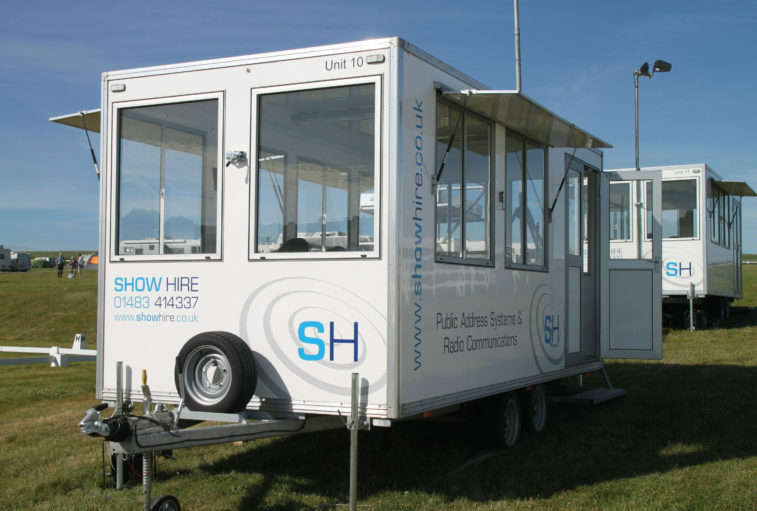 Unit DD1 is a twin-axle, two-tier commentary box trailer with 360-degree visibility upstairs through all-round tinted windows. It is also fitted with 240v sockets. Designed to be used either alone or linked via the network to a double-tier control unit, all single-tier units can be equipped to suit. 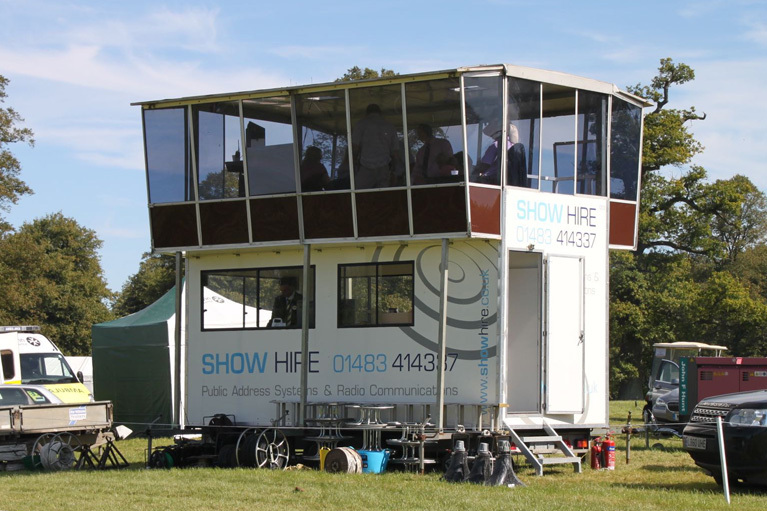 Whether used as a commentary position, a control centre, or portable office space for administration, all requirements can be accommodated. 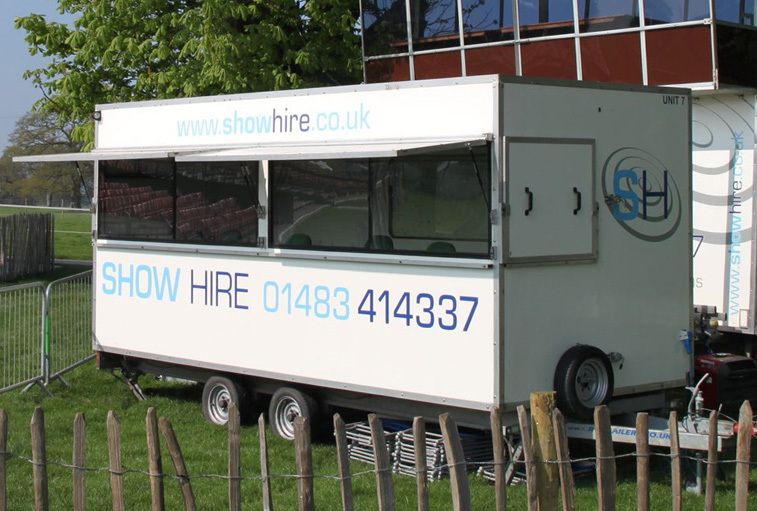 Unit SD11 is one of the two latest additions to the Show Hire fleet. It’s a twin-axle box trailer with 180-degree visibility through forward- and side-facing windows. There is also a rear-facing window, strip lighting, a gas heater, and a permanently installed forward-facing desk, with seating for six people. 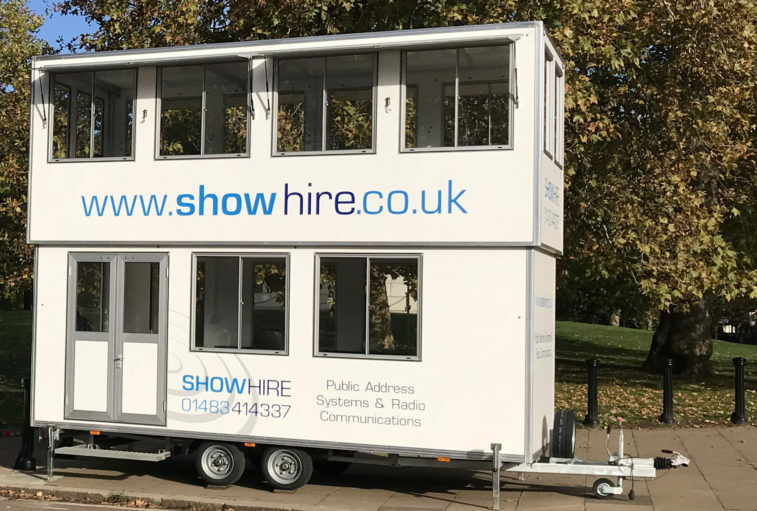 Unit SD10 is one of the two latest additions to the Show Hire fleet. It’s a twin-axle box trailer with 180-degree visibility through forward- and side-facing windows. There is also a rear-facing window, strip lighting, a gas heater, and a permanently installed forward-facing desk, with seating for six people. Unit SD9 is a twin-axle box trailer with 180-degree visibility through forward- and side-facing windows. It also offers a rear-facing window, strip lighting, 240V sockets, a 16-amp mains hook-up, a gas heater, and a permanently installed forward-facing desk, with seating for six to eight people. Unit SD8 is a twin-axle box trailer with 180-degree visibility through forward- and side-facing windows. It also offers a rear-facing window, strip lighting, 240V sockets, a 16-amp mains hook-up, a gas heater, and a permanently installed forward-facing desk, with seating for six to eight people. Unit SD7 is a twin-axle box trailer with 180-degree visibility through forward- and side-facing windows. It also offers a rear-facing window, strip lighting, 240V sockets, a 16-amp mains hook-up, a gas heater, and a permanently installed forward-facing desk, with seating for six to eight people. Unit SD6 is a twin-axle box trailer with 180-degree visibility through forward- and side-facing windows. It also offers a rear-facing window, strip lighting, 240V sockets, a 16-amp mains hook-up, a gas heater, and a permanently installed forward-facing desk, with seating for six to eight people. Unit SD5 is a twin-axle box trailer with 180-degree visibility through forward- and side-facing windows. It also offers a rear-facing window, strip lighting, 240V sockets, a 16-amp mains hook-up, a gas heater, and permanently installed forward-facing desk, with seating for six to eight people. Unit SD3 is a twin-axle box trailer with 180-degree visibility through forward- and side-facing windows. It also offers strip lighting, a gas heater, and a permanently installed forward-facing desk, with seating for six people. 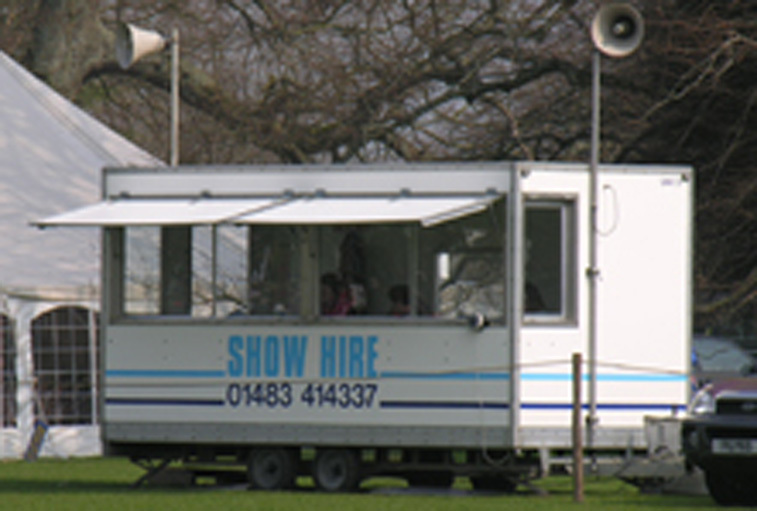 Our PA Trailers are unique; they are complete public address systems on wheels. 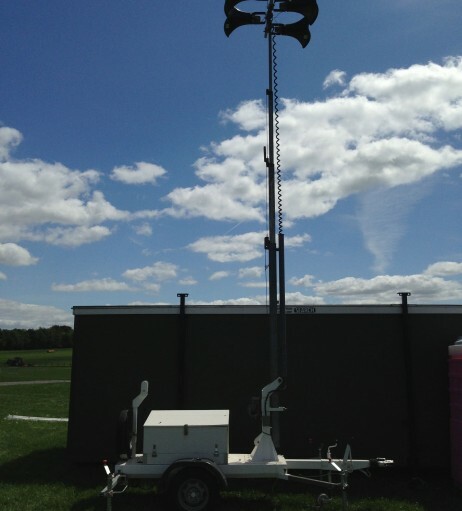 Each has a 27-foot telescopic mast onto which are attached 4 horn type loudspeakers. At the bottom of the mast lies a battery powered amplifier, a microphone on a long lead, a CD-player (or phone/iPod input, if required) and a remote hand-held radio microphone, all of which is self-contained and weather proof.